Following water safety checks at Ashland Lake this week (week commencing 23rd July 2018), a potentially toxic bloom of blue-green algae has been reported to the Environment Agency. As a precautionary measure, notices are being posted at the lake warning that contact with the algal scum should be avoided. Blue-green algae naturally occur in inland waters and blooms can form when their numbers become excessive. It is these ‘blooms’ that give the water a blue-green appearance or a ‘pea soup’ like colour. The behaviour of these algae is erratic and the level of its toxicity can fluctuate; it can appear one day, be dispersed by the wind and, mix and re-accumulate at any time. How can blue-green algae affect you and your animals? Blue-green algal blooms can produce toxins hazardous to both people and animals. Not all blue-green blooms produce toxins, but it is not possible to tell which are dangerous without testing, and therefore all blooms should be considered potentially toxic. 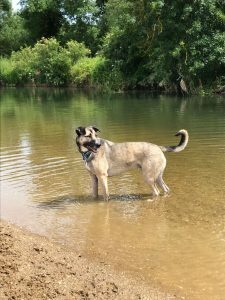 Dogs that enjoy swimming and playing in lakes and ponds may be exposed to blue-green algae. Aggressive, immediate treatment is necessary to help treat this quick-acting, potentially fatal poison. If there are any signs of illness in your animal after contact with the water, contact us immediately on 01908 397777.